When I was a little girl, I wasn’t so much into dolls and playing house and other girlie activities as I was into horses. I had a collection of Breyer brand horses (http://www.breyerhorses.com), the hard plastic kind that were designed to look quite realistic. My mother recently found my collection under her house, and brought them down when she was visiting this past weekend. The girls divided them equally (there are 10 in all) and spent the entire day making up little horse adventures and having little horse conversations (think: lots of neighing and whinnying, mixed in with English translations of these sounds). String Bean’s style of playing is pretty rough, with horses jumping around each other, crashing into each other, and yelling at each other before they run screaming away from some invisible monster or evil witch. But Peanut’s horses are quiet types that eat together, go for walks together, and give each other kisses before laying down to sleep. She takes her time to pet each horse, talking to them in soothing tones as she cares for them, and each horse already has a name. Peanut’s version of horse play is exactly the same as mine was as a child, and it takes me back to watch her. In those quiet moments, as I replay my own happy childhood memories while watching Peanut creating her own, I’m reminded of another great thing about motherhood. There are so many insignificant little moments from my childhood that I’ve forgotten over the years, silly little games I used to play, joyful songs we used to sing in preschool, quiet moments where I felt completely content with the world around me. Seeing Peanut totally entertained in her own little world is a nice way to go back to those forgotten moments. So often since having kids I’ve felt like their existence somehow saps my brain, making me forgetful, distracted, much more absent-minded than I ever was pre-kids. It’s nice now to see that they also have the ability to rekindle my memory, and refill all of those empty spaces in my mind that they’ve created these past few years. The other day, String Bean was fussing for a snack. By fussing, I mean she wanted something, but everything I offered her was all wrong, for reasons that made no sense to me. After a frustrating round of “what about this, what about that?” she climbed up on the counter and dug through the cupboards herself. Somewhere way in the back, she found a box of graham crackers. When she was about 18 months old, she used to call them “grandma crackers,” because it was her grandma who introduced her to them, and the word “graham” held no meaning. Just a cute anecdote. Anyway, I thought graham crackers sounded fine, especially if she had them with milk. I mean, that’s practically a healthy snack, right? She thought I was crazy when I poured her a cup of milk and told her to try dunking the crackers into it. She kept giving me her skeptical look (one eyebrow raised, the same look I give when I’m not buying into something) until I told her that used to be one of my favorite snacks at her age, and grandma’s, too. For whatever reason, ideas that come from grandma are infinitely superior to ideas that come from mom, so she gave it a try. She went through three glasses of milk, a big stack of graham crackers, and kept grinning and laughing every time at how silly it was to dunk her food into her drink, and have it be okay. Not just that it tasted good, but that mom condoned it. Sure, she ruined her dinner on it, but the cuteness of the whole activity was worth it. One problem with flying solo for so long is that you get run down, start to relax the structure, and kids pick up on any weakness. The girls, who are by and large such good girls, have been getting a little stir crazy in the evenings. Little scuffles are breaking out, and no matter how many times I tell them it’s time for PJs and tooth brushing, they ignore me, sometimes even running away laughing, as I, too exhausted by the end of the day to give chase, yell at them to come back, which is even less effective than doing nothing. The other night, at my wit’s end and anxious to get them to bed so I could finally have some much-needed quiet time after a hectic day, I had an idea. When I’m tired, I’m not as good at being creative, so I really should write all of these ideas down when I’m wide awake and newly caffeinated. Anyway, I went upstairs without a word, and put on my junior prom dress that we’d unearthed at my mom’s house last weekend. The frilly, lacy, awful powder blue 80s creation that String Bean is obsessed with. I came downstairs as if nothing had changed, holding PJs for two squealing, squawking girls who were embroiled in tug-of-war over something. They both took one look at me and let go of the toy they’d been ready to kill each other over moments before. In my best Cinderella voice I asked them to gather around for a final potty run, PJs, tooth brushing, and hair brushing, and, to my amazement, they obeyed completely. Not only were they willing to be subjected to every step of the bedtime routine without complaint, but they showered me with compliments the entire time. “Mommy, you look so beautiful! Like a princess!” The dress doesn’t exactly fit. Two pregnancies and twenty years later, the zipper will only go halfway up, but String Bean beamed that this was wonderful, too. “You have some air going in there, to keep you cool!” she cooed. I’ve already made a mental list of my other dresses for future rowdy, relentless nights. I have a black velvet number leftover from years ago, when I had season tickets to the opera. I have my flag squad uniform from high school. I have the bridesmaid dress from my best friend’s wedding. I have my wedding gown, which would push String Bean over the edge into some kind of unnatural bliss. I think I’ve got the next week covered. Yesterday String Bean had her dentist appointment, and next week it’s Peanut’s turn. We’ve had moderate success with previous dentist trips. The girls are fine with the tooth cleaning part, since the spinning little tooth polisher feels just like the spinning toothbrushes we use at home. And both girls are so obsessed with floss that I actually use it as a reward for good behavior. But that doesn’t mean they don’t get nervous at the sight of that big reclining dentist chair with the spotlight above it. And neither one has ever had a decent set of X-rays taken. Something about the funny thing in the mouth, plus that heavy lead apron, plus having Mom and the tech scurry quickly out of the room while the big machine at their side beeps at them, is just too much to sit through. This time, to better prepare them both, we had a mock dentist appointment at home. I set up a chair, and had them take turns leaning back for me to poke and prod in their mouth, brush and floss their teeth, then take pretend X-rays. At the end, I rewarded them each with a balloon—just like their pediatric dentist does—for being so well-behaved. Really, we couldn’t have been more prepared. Except that String Bean was up in the night, and was already cranky and tired before we even got to the dentist. When they tried to get X-rays, and instead got a very tearful, terrified four-year-old curled into a ball and pleading to go home, we gave up on those (again). She refused to sit through the polishing, which last time was the easy part, until we all agreed they could clean her teeth from my lap. I know they do this with small children, but String Bean is only 18 inches shorter than me, probably less by now, so it was a little ridiculous trying to hold her across my lap like a baby. But her teeth got cleaned, she got her balloon and a toy (actually she insisted on two, one for her sister as well, which just warmed my heart), and by the time we got home she was all smiles again. Maybe next time, when she’s five, we’ll finally get those X-rays. My mother is considering moving back to the Bay Area in the next few years, and part of that long-term plan is getting rid of the clutter around her house that she doesn’t want to move along with her. She’s been slowly cleaning out her basement, digging up boxes of Christmas ornaments she no longer uses and the doll house from her childhood, a metal one now completely rusted through the bottom. All of those boxes of precious mementos from my youth that have been gathering dust for 15 or 20 years have also been unearthed, and last weekend while I was visiting, Mom presented me with box after box of stuff. Much of it brings back sweet memories of childhood best friends collecting matching trinkets, or of the grandmother I lost twenty years ago, or of the high school flag squad I was on. From the bottom of a deep box we pulled out my baby blue satin and lace dress from my junior prom. String Bean, of course, spent the better part of the day wearing it, tripping over the hem and holding the bodice in place with two hands, and loving every minute of it. I never found the unicorn figurines that I can so clearly remember from my childhood bedroom, maybe they broke in the last move, or were sold at one of the family garage sales years ago. After perusing the contents of box after box, finding an equal number of favorite things as objects I literally have no memory of, I thought I’d narrowed down my pile of things to keep to one small stack. Then String Bean and Peanut got in on it, and now we have a vast assortment of dusty stuffed animals, ancient articles of clothing, and random curios destined for our house. Of course I’m amused at seeing these forgotten treasures getting a new audience to adore them all these years later. But I’m also secretly hoping not all of them survive the trip back to our house. Last week, when Peanut was running a fever of 102 and had to miss school, she seemed happy to be staying home with me. That is, until we dropped String Bean off at school, and Peanut saw all of her friends heading into her preschool class. Then she started complaining that she wanted to go to school, to see her friends, and because she needed to paint. I stopped by her class, to tell the teacher (who is also the school director) that she wouldn’t be attending that day, to warn her that some bug was clearly going around, and to relay the message that Peanut was sorry to miss class because she needed a painting fix. The teacher smiled, turned to Peanut and said, “You want to paint? How about doing it at home today?” She led us to the storage closet, handed me a watercolor painting kit, and wished us a good day. Peanut was thrilled, once the Tylenol kicked in, to spend the morning painting pictures without a big sister’s interruption, and without the time limit imposed by school schedules. And I was thrilled by the gesture this teacher/director made. I’m halfway through hubby’s 16-day business trip, a hectic tour of four European countries and I forget how many cities. It’s the longest we’ve been apart, the longest the girls have gone without him, and, so far, we’re surviving, despite Peanut being sick and keeping me up all night twice, and not getting my preschool-time morning breaks, since she was too sick to go to school. I’ve called in reinforcements to make sure I have a few hours to myself every few days, including having my mom visit for two days, and going to visit her for two days, and aside from that I’ve just got a “let it slide” attitude going. The other day, when String Bean was supposed to be having her quiet time so her sick sister could nap, but she kept making too much noise, I just laid down on her bed with her for a half hour, sharing my favorite memories of her as a baby (her favorite story is the way the NICU nurses called her “princess” from day one. They meant she was a high-maintenance baby, but she thinks they were predicting that she’ll marry a prince, live in a castle, and get to attend magical balls). The laundry’s piling up, the dishes are only getting done once a day, the dog isn’t getting walked, and we’re out of all groceries except milk and Annie’s macaroni and cheese, but I’m not worrying about any of it right now. We’re having lots of cuddle time on the couch and making up silly games and playing dress up, trying to keep String Bean engaged while Peanut gets some much-needed rest, and I try to fend off whatever bug she has with taking Emergen-C and washing my hands every ten minutes. Hubby returns a week from today, is home for a day, then leaves again on another business trip. By then, we should have this whole flying solo thing down to a science. At some point I will have to break down and hit the grocery store, and do at least one load of laundry. But not today. Today we have some coloring books that need our attention, and a make-believe ball to attend in our princess gowns. Halloween came early to our house this year, primarily because String Bean wants to be Cinderella this year, and when I happened across a not-terribly overpriced Cinderella costume in her size, that showed none of the wear and tear of costumes on racks later in the season, she was with me. I tried to figure out how to buy it without her seeing, so I could hide it away upstairs (with Peanut’s Snow White costume), but it didn’t work out. The downside is that she always wants to wear the costume now, and I’m worried it’ll get wrecked before Halloween. The upside is that when wearing the costume, she adopts the mannerisms of a princess. She walks on her tiptoes in a sweeping, ballet-like fashion, moving slowly so as to avoid wrinkling the dress, she keeps her hands at her sides, gently resting them on the puffy skirt of her gown, she even holds her mouth in a princess-like half-smile the entire time. The overall effect is that when wearing the dress, she isn’t running, jumping, screaming, tackling or playing tug-of-war with her sister, or rolling around on the floor underfoot. In fact, she pretty much stands before the mirror, just twirling in slow motion or waving to her imaginary minions. Hopefully the dress survives intact until Halloween. But even if it doesn’t, I’m getting my money’s worth out of it in good behavior. Two years ago, for a Christmas present for all of the immediate family members, I created a book about the girls. It was 24 pages long, in full color, with big glossy pages chock full of photos and accompanying text about milestones (first words, the age when they got their first tooth, when they took their first steps) as well as little anecdotes about trips they’d taken, their favorite outings, their earliest hobbies. It was a hit with the family, and I kept one archival copy for us (although, to be honest, I have no idea where it is right now). The other day, as I was cleaning off my desk, heaped with years worth of miscellaneous papers, I came across the final draft of the book, printed on our home printer in basic black toner. It’s hard to make out the fine details of the photos in the dark copy, but as soon as the girls saw it, they recognized themselves. I’ve been reading them that book every night for bedtime for the past few days. It makes me feel better about never doing a baby book for either of them. Between the photo book covering their early years, and this blog, maybe I’ve done as much, or even more, than a baby book would have. String Bean’s obsession with my wedding dress continues, with her feeling the intense need to see the dress, still hanging in the huge white garment bag in my closet, on a regular basis. And last week she started asking about my shoes. What shoes had I worn with the dress? Where were they? Could she see them? Could she touch them? 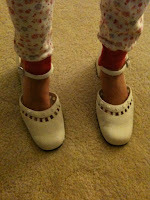 I had no memory of what I did with the shoes, so for a while I put her off by saying I think I gave them to Goodwill. They were inexpensive white pumps that I knew I’d never wear again, so I couldn’t imagine hanging onto them. You can’t see them in a single wedding photo, so I couldn’t even remember what they looked like. Then one day, out of curiosity, I dug around in the back of my closet and unearthed a vaguely familiar shoe box. Inside were my wedding shoes exactly as they looked at the end of my wedding day, white pumps with heels dirty from tromping around on grass and dirt at our outdoor wedding and reception. I surprised String Bean with them after her quiet time (we’ve given up on the notion of her ever napping again), and she hasn’t taken them off since. It’s a little ridiculous, watching her struggle to go up and down stairs in these heels that are about twice her size, but she simply adores them. It’s a win win, because not only do these forgotten shoes now have someone to properly love them, but I now have something precious to threaten to take away any time she starts getting too out of hand. So far, it’s worked like a charm. This is Peanut’s third week of preschool. I think she’s doing well, since she never cries when I drop her off, and is always smiling when I pick her up, but I don’t really have a sense of how she spends her days. I realize that she’s only two, and while String Bean gives me the run-down on her entire school day in the car after I pick her up, she was pretty mum about the particulars when she was only two, too. I don’t know if she can’t remember her day or if, as chatty as she is, she just doesn’t feel like reliving it. When she’s calm and focused, I’ve asked her if she likes school, and she always says yes, so I’ll assume that whatever she does remember from her bi-weekly morning sessions there, it’s positive. The other day we had an impromptu play date with the neighbor boy two houses over. He’s four, and in String Bean’s preschool class, but while they had weekly play dates for their first two years of life, they rarely interact at school. My girls were outside waving at the cars and pulling weeds on our lawn (if I call them flowers, and ask them to pick them, they’re more than happy to do it all for me), when he ran over to visit, then invited the girls back to his house to see his favorite toys. The girls had a great time with him, racing up and down the stairs, playing catch, exploring his toy collection, and his mom and I, who used to visit together almost daily, but now rarely do, had a nice chat together. When dinner time rolled around, I herded the girls home, to much protest. A few minutes later my neighbor called to say as soon as we’d left her son had said, “Why couldn’t you have had her first, Mom, so I could have a sister?” Apparently, despite the fact that he and String Bean don’t play together at school, he still has a fondness for her. I told String Bean what he’d said, and she laughed and called him silly, but I notice she’s repeated it about a dozen times. She also keeps asking when we’re having another play date at his house. So even though she doesn’t play with him at school, or even acknowledge that he’s there, I guess she still has a fondness for him, too. One of the things I hoped for with having two kids a year and a half apart is that they’d be close, not just in age, but in everything. Be careful what you wish for. Actually, I’m glad they’re so close. Mostly, I like that when given the option of playing solo or together, they always choose to play together. Until the tug-of-war games start, and I have to play referee. Then I wish there weren’t quite so inseparable. One reason I wanted two girls 20 months apart is that my sister and I are 20 months apart, and we’ve been best friends since I was about 8 years old (prior to that, we fought constantly). We’re different enough that we never competed for anything, but similar enough that we never ran out of shared interests to keep us hanging out together. Now I realize that my girls are so much closer, at a much younger age, that their relationship may turn out differently. They are also very different sorts, with String Bean as the one who wears her heart on her sleeve, and Peanut as the one who never lets her emotions get in the way of having a good time, Peanut as the more outgoing one, and String Bean as the quieter one. But I’ve noticed lately that String Bean’s competitive streak is kicking in. Everything she does is faster, harder, better, and she feels the need to tell Peanut all about her superiority. At this point, Peanut doesn’t seem to care, and whenever String Bean shouts, “It was a race, and I won! I’m better than you!” Peanut just smiles and goes on about her business, totally unaffected. But what happens when Peanut can actually understand what String Bean’s saying? Will they lose some of their chumminess to competition? I’m curious to see. Peanut has been having nightmares every night for a couple of weeks now. Usually around 2am she’ll wake up crying. Sometimes she calls me right away, so I’ll go in, scoop up the sleepy thing, sing a quick song to her as she falls back asleep on my shoulder, then put her back to bed. But a few times, it’s been something else. She wakes up talking, saying “no” or “I don’t want…” in a sleepy voice, obviously winding up for a full cry as she does so. By the time I get into her room, her face is wet with tears and she’s fully crying, almost screaming, while thrashing violently, crashing her head and body against the bars of her crib. When I try to pick her up to comfort her, she starts kicking at me, screaming more, sometimes even calling “Mommy!” as if she doesn’t recognize me. I usually wrestle her out of bed then sit down with her on the never-used guest bed that’s in her room, letting her thrash it out in a safer place, talking to her until she settles down enough to allow me to comfort her. Sometimes these episodes last for ten minutes, sometimes for forty minutes. Often the next day she has no memory of it, or will only remember of a small part of it. At the cabin it happened, and the only thing she remembered was her baby cousin crying in the night, not that it was her own screams that woke the baby. I haven’t figured out what causes these night terrors, if that’s what they are, or the best way to get her through them. She seems fine the next day, maybe a little tired from the lost sleep. It’s just another one of those child mysteries that keeps us parents guessing. I’m hoping this particular phase is short-lived. String Bean has a new obsession: unicorns. I don’t know exactly where it came from, but in a week’s time it went from idle curiosity (“are they real? what do they eat? where do they live? do they neigh?”) to full-blown obsession, where she wants unicorn books, movies, toys, and clothes. She’s a little like her dad in that, this urge to steep herself fully in any new interest, and while I don’t have a problem with that in general, I do have a problem with stocking up on unicorn stuff just to have this fascination fade in a month or two. The funny thing is, at about the same age, I was also heavily into unicorns, so somewhere under my mother’s house, stuffed in old storage boxes, there is a pretty good stock of unicorn paraphernalia, just waiting for a new little girl to love them. Hubby’s going to be doing a lot of traveling this month, so I’m planning on at least one trip up to mom’s house for a hand with the kids and a change of pace from the usual home routine. I’ll be down there, in the storage space under her house, braving the spiders, scorpions, and lizards, trying to scrounge up some unicorn mementos to appease String Bean’s new need. And then I’ll sit and watch her play with my old toys, enjoying the full circle they’ve made. The annual Labor Day trip to the family’s cabin in the Sierras went well. There wasn’t any napping among the girls, and there were some 2am nightmares, with Peanut screaming so loud she woke the entire cabin, so we were all a little sleepy, but we made the best of it. The dog was hiked to oblivion, and the fisherman caught a few keepers and a lot of little guys he threw back, and the crowd enjoyed dining at the huge farm table my grandfather made with his own hands, and sitting around the fire out back at night, waiting for the little ones to drift off inside, playing guitars and sharing funny stories and remembering good times on previous trips up to the cabin. One of the best things for me is watching my girls pal around up there, exploring every trail, pocketing handfuls of pretty rocks, marveling at the birds, butterflies, and dragonflies, splashing around in the swimming holes I used to play in when I was their age. My mother has spent her summers up here since she was born, as have I, as have my children. It’s nice, in this rapidly changing world we’re bringing our kids up in, to have something as constant as that, existing unchanged for generations. So another summer of vacationing up there comes to an end. Next summer the girls will be a bit bigger, a bit braver, able to hike longer and maybe swim in the bigger swimming holes. They’ll also a bit more able to understand the history of one of their favorite places to visit, to learn a little more about the great grandpa they never got to meet, but who built such an amazing place with his bare hands. This weekend we’re off to our family’s cabin in the Sierras, for our annual Labor Day end-of-summer vacation together. There will be eleven of us there in all, a reasonably sized group, perfect for busy dinner conversation, late night chats around the fire out back, large enough to break into groups of hikers, fishermen, and book-readers each day, but not too large for the small cabin with its one bathroom. It’s nice to have a place to go where everyone is like family, and kids run around together, and dogs roam freely, visiting all of the cabins like official camp greeters. And the fact that my mom will be there to help out with the munchkins is pretty nice, too. Also coming are my sister and my five-month-old niece, who is growing in personality and size so quickly that I feel like if I don’t see her for a week, I’m missing some special milestone. It’ll be nice to spend three solid days with her to see what new tricks she’s up to. Now, if I could just get some sort of guarantee that the kids will sleep up there (always an issue), I’d consider myself home free. Okay, not every post will be about school from now on. But here’s another one, anyway. So, today was Peanut’s second day of school. Like Monday, she didn’t cry at all when I dropped her off. Instead I got her trademark scowl (“mad face” as she calls it). When I gave her a hug and said she should go play with her new friends, she hugged me back, scowled, then said “No.” I told her she could draw, paint, do puzzles, make a necklace, and she furrowed her little eyebrows and said “No.” I told her I’d be back soon, and she glared at me: “No.” So, I gave her a final hug and kiss and left. I turned around as I went, and she wasn’t crying or making a fuss, just scowling at no one, standing in the center of the room, a bustle of other kids and parents all around her. So, the two things I was prepared for at drop-off were tears or total joy at being left there, and, like any child, she decided to throw me a curve ball by being angry instead. I’m sure that once she’s used to the routine, it’ll go much smoother. I know once the teacher gets the kids all trained up, she has them sit in circle as soon as they arrive, and String Bean was always quick to say goodbyes to get her favorite spot in circle. It’s a very large class this year, so it might take the teacher a few weeks to get all 25 3-4 year olds in line, but once she does, I’m hoping Peanut falls right in line with them. Or at least starts giving me the kind of goodbye I’m more experienced at dealing with. What is the deal with balloons, anyway? I am constantly amazed by just how fascinated my kids are with them. They please them like few other things do. It doesn’t matter if they’re big or small, full of helium or just breath, they are kept and coddled, stored in special places in the house and mourned greatly when they either deflate or pop. The girls carry them around like babies, play catch with them, and sometimes ask me to draw faces on them so they can give them names and personalities, creating little scenarios for them to act out. They fight over balloons as if they were some prized possession, while the fancy, expensive toys sit unused on the sidelines. The girls each received one balloon at our Friday play date, and another at a picnic we went to on Saturday. You’d think the enthusiasm would be wearing off by now, but no. Just this morning I had to break up a fight because String Bean had decided that all of the pink and purple balloons were hers, which meant that she had three while Peanut only had one. While we have mornings where they could’ve had this same fight over a handful of Cheerios, it’s the balloons that always bring out the most guarding behavior. But since they also bring out the most creative behavior, I haven’t taken them away. Yet.